BigChange technology will save Elliott millions of pieces of paper annually and has significantly improved back-office administration. Technicians receive their work orders instantly on the BigChange app with paper job-cards and proof of delivery worksheets replaced by job-specific electronic workflows that guide technicians at every step including risk assessments. Technicians no longer need to return paperwork to the back-office, saving a huge volume of previously manual back-office processing. The hire-specific turnkey solution from BigChange has introduced a paperless revolution, equipping mobile technicians with Samsung and Motorola Android tablets that manage receipt of job instruction, electronic proof of collection and delivery, site servicing, timesheets, electronic start-of-day vehicle walkaround checks and Health and Safety procedures. The system is also a rich vehicle tracking system providing real-time location updates, driver behaviour scoring and tachograph interface. 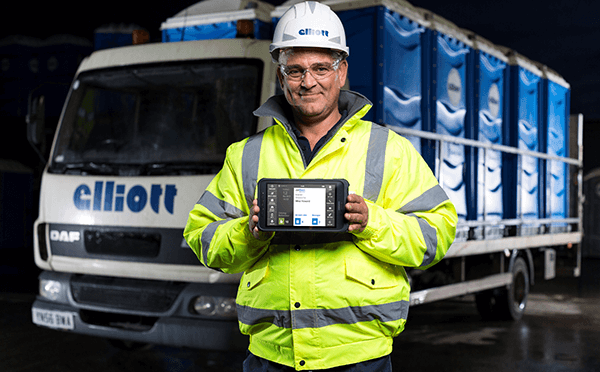 The system is fully-integrated with the Elliott Rental Management system meaning that planned tanker services, toilet maintenance, deliveries and collections are automatically pushed through to BigChange. On logging on to the app at the start of each day, drivers and technicians are guided to start their timesheet, conduct a walkaround check that meets DVSA requirements (recording, photographing and alerting any vehicle defects) and have instant access to their jobs for the day. In the back-office, the system is enabling planners to respond faster to customer needs, intelligently allocating work orders based on real-time technician availability, skills and live location. 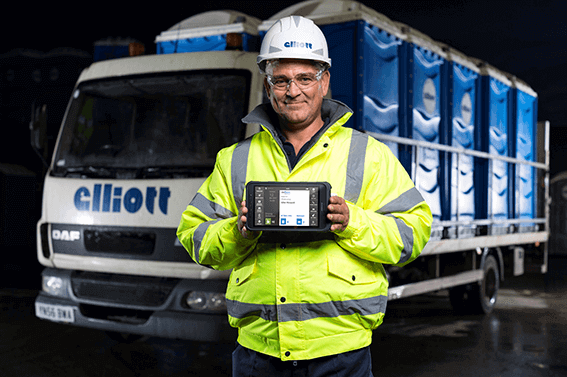 This is significantly increasing productivity and enabling Elliott to maintain its position as the UK’s largest provider of portable toilets and efficiently provide same-day service from its hire branches nationwide to clients across the Construction and Events industry. Its portable loos are used by top-tier construction companies such as Carillion, Keepmoat, Costain and Wilmott Dixon and for flagship events including Glastonbury, Cancer Research UK events and the Olympics. The BigChange system is providing a detailed work and maintenance history for all rental assets, giving management visibility of productivity and utilisation across their operation as well as a real-world view of how long jobs are taking. The company are using the insight and data to create dashboards that will be shared with customers, giving them a transparent view of the service levels they are receiving.